It may be the season of gift-giving or Santa Claus but if there’s on thing Filipinos can relate to more than anything, it’s the food. That’s why this time of the year, the spotlight is, more than ever, on the kitchen creativity of females who are tasked to concoct sumptuous Noche Buena dishes for the whole family. For most Pinoys, togetherness and merriment during Christmas means bonding over yummy feasts in a roomful of family and friends. Or that was how it used to be until the recent onslaught of typhoons that destroyed homes and took lives of many Filipinos. But even if a lot of people may have lost properties or loved ones, the innate optimism still lies in the Pinoy blood and this inspired Kraft Eden Cheese to bring back the joy and faith of Filipinos during the festive occasion. The well-loved cheese brand launched the Keso De Gallo – a nationwide event coinciding with the traditionally celebrated Misa De Gallo (a Catholic Christmas tradition wherein nine dawn masses are held starting December 16, which will culminate on Christmas Eve). Parallel to the nine-day Simbang Gabi, Eden will bring the goodness of Filipino dishes to Pinoys in nine different towns including Bacolod City, Iloilo, Davao, Cagayan de Oro, Cebu City, Naga, Butuan City, Laoag and Pampanga. In cooperation with top media outlet ABS-CBN, non-government organizations and the local government units, Eden has been setting up programs and activities in different towns, wherein a cook-off was also held for the most innovative native dish that incporporated Eden cheese participated by various schools. The winning dishes were then served as a treat to the churchgoers after the mass. 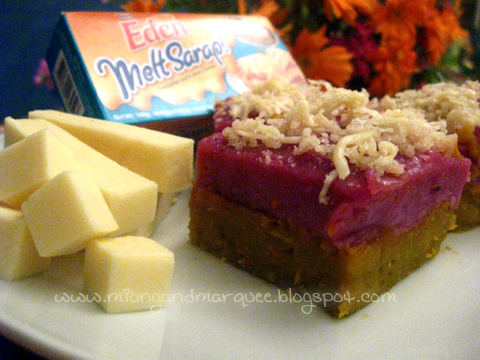 Not only did the people tastes their native bibingka and puto bumbong (traditional egg and rice cakes) made more delicious with Eden cheese, they were also able to make new cheese dishes that everyone enjoyed emphasizing Eden’s versatility campaign, because we can do so much with Eden Cheese. Known for its quality and wholesome taste, Eden has been a staple of every discerning foodie’s kitchen. From simple snack to sophisticated main courses, Eden cheese products can be relied upon to deliver great tasting meals. A versatile ingredient which easily fits in a variety of local dishes, the use of Eden cheese products is as limitless as the imagination of its user – just like how immeasurable this season’s joy is. “With Eden cheese, we will explore the wonders of our country’s cuisine while providing an extended feast that will bring joy and delight to as many families as possible,” ends Tacderas. 2 comments: on "9 Days of Cheese-mas with Keso de Gallo in Cebu"
btaw atty. 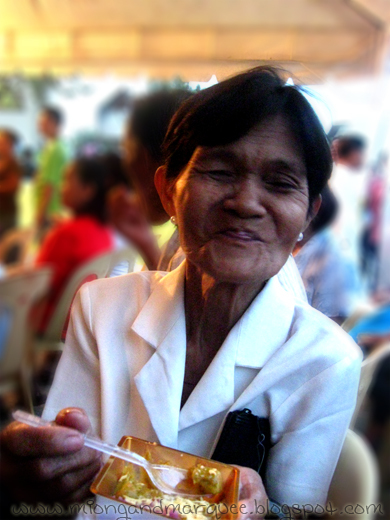 wala ni nko maapil sa photo.contest.^,^ naa unta potential si lola. Happy New Year pod LaagCebu.com blogger!